Description: Why stay anywhere else when this Put-in-Bay Bed and Breakfast location offers it all….a great location and each tropically themed guestroom is beautifully appointed with a king size “Heavenly” bed, private in-room bath, 29″ flat screen cable TV, WiFi, A/C, mini refrigerator, coffee maker & Sleepmate sleep machine. We offer a variety of guest room styles, on-site golf cart rental, 2 outside patio areas as well as friendly innkeepers who are eager to make your stay memorable. Description: The English Pines is a circa mid-1800’s original island settlers’ home. A lovely historical home with Greek ornate styling, the English Pines is within walking distance to downtown. Situated on two acres of land, the English Pines is conveniently located 2 blocks from the winery and caves. Looking for a cozy retreat for a business meeting? How about an intimate location for your wedding party? This Put-in-Bay Bed and Breakfast caters to many groups and will host your 2006 family reunion, wedding or business retreat. All of our rooms are air-conditioned and have televisions. A delicious and bountiful continental breakfast is included daily. Enjoy your stay in one of our many themed rooms, including The Monet Room, The Seashell Room, and The Florida Room. Description: With the best island location, the Put-in-Bay Bed and Breakfast AHOY offers upscale rooms for couples, all with king beds, private bathroom, TV, fridge, WiFi, and AC. Guests can enjoy deluxe continental breakfast, complimentary bicycles, and golf cart rental on site. Only 2-minute walk to downtown shopping, dining, and entertainment. Please, visit Ahoy’s website and FB page for current specials, photos, guest comments, and a full listing of amenities. Friendly innkeepers want to make your island getaway special and memorable! Open year round. Description: Arbor Inn is a quiet couples-only Put-in-Bay Bed and Breakfast retreat located on a 3-acre wooded lot overlooking winery’s vineyards – a birdwatcher’s paradise. Spacious rooms – all with king bed, private bath, AC, satellite TV/VCR, and hairdryer. Hot breakfast served Sat and Sun, deluxe continental breakfast Mon-Fri. Golf cart rental and complimentary bicycles. Butterfly House, winery, and caves close by and a short walk to town. Description: Our Put-in-Bay Bed and Breakfast extends a warm invitation for you to be our guest and allow the atmosphere of an old country inn, with its feeling of unhurried living, to surround you and create a mood of long ago. Business or pleasure, you’ll find your lodging needs most comfortably met. Our Front Porch is a favorite of all of our guests. You can sit and watch the world go by… Hardwood floors, lofty windows, paddle wheel fans, and antique furniture and lighting recreate a warm and comfortable 19th Century feeling in each of our thirteen guest rooms. A variety of accommodations are offered to fill our guests’ specific requirements. Description: The Getaway Inn Put-in-Bay Bed & Breakfast is centrally located in a quiet area of the Village. It is just two blocks from the main street of Put-in-Bay, the caves, winery, family fun center and churches. The B&B is fully air-conditioned and has six comfortable rooms. All rooms have a queen size bed, cable television, and a private bath. One room has a second queen size bed, two rooms have a twin sleeper sofa and one room is a suite with an additional two twin beds and a sitting area with a twin sleeper sofa. Relax on the front porch or beautiful patio. During the week, children are welcome. On in-season weekends, we limit our rooms to two persons in each room. Description: Centrally located in a quiet area on Langram Rd. (Airport Rd. ), Just a 10 minute walk or less to downtown Put-in-Bay, the caves, winery, family fun center and churches. 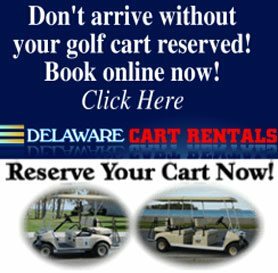 Explore Put-in-Bay by renting a golf cart! Description: These lodgings are a 2 to 5 minute walk to the Jet Express, the bus to the car ferry, Perry International Peace Memorial and Visitor Center, downtown Put-in-Bay, night life, dining, and more, yet located in a quiet area. Explore Put in Bay’s caves, butterfly house, family fun center and more! The house accommodates only couples, families and people on the island to fish. If you bring your own vehicle and trailer, there is plenty of parking. We are only a 2 or 3 minute walk to the boat launching ramp. Description: A century old home on Put-in-Bay, South Bass Island. It sleeps up to eight and is suitable for couples, or families. We can accomodate fishing parties in the spring and fall. (No bachelor or bachelorette parties.) The home features high ceilings, lots of woodwork, foyer, open stairs, large living room with cable TV, VCR, DVD, dining room, and front porch. The kitchen has china, cutlery, pots and pans, smooth top stove, dishwasher, microwave, coffeemaker, salt, pepper, sugar and paper products if you wish to prepare food. Rooms are individually air-conditioned and heated. The house has 1 1/2 baths. All linens are provided. Smoking is allowed on the large front porch or backyard patio.